The Vikings were the people who came from Scandinavia (Denmark, Norway, and Sweden) from about AD 700 to about 1125. This period is called the Viking Age. [a] Vikings traveled great distances in their longships, as traders, settlers and warriors. Many of the Vikings were tall and had red or blonde hair and beards. 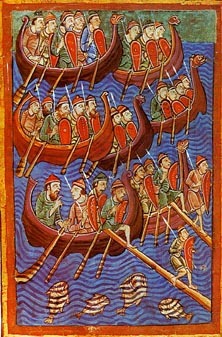 [b] Villages on or near any coast in early medieval Europe lived in great fear of Viking attacks. Some of the countries most affected by Viking piracy were England, Scotland, Ireland, Germany and France. The first recorded raid in the west was at Lindisfarne in 793. Europeans were frightened of the Vikings because of their strong weapons, swift attacks, and cruel fighting tactics. They were known for their bad treatment of women, children and monks in the places where they fought. When the Vikings came to England, the English kings paid them to leave the country, but the Vikings took their money and sometimes fought them anyway. These payments were called Danegeld. From the 9th century to 1066, when the French Duke of Normandy, who became King William I of England conquered it, Danish and Norwegian Vikings ruled large parts of England. The Vikings were called Rus by the peoples east of the Baltic Sea. The name Russia is from the name Rus, the Vikings who settled in Kiev and formed the first Russian state. The Vikings, or Rus, who served the Byzantine Emperors were called Varangians. They became the personal bodyguards to the Emperor and were called the Varangian Guard. ↑ The dating of the 'Viking Age' depends on the location and how the term is used. Generally it is from about 700/800 to about 1030/1100 (later for some purposes). In Ireland, the Viking age was from about 825–885 and 910–999. In France from about 834–890 and in Southern England from the 840s–910. In studying Vikings and their religion, the dates of the Viking Age are from about 800–1300. ↑ Scandinavians typically were of mixed hair color; natural red hair color being roughly between 5-10% of the people who lived there. But men used the same harsh lye soaps as women did that had a bleaching effect making their hair and beards reddish blonde to blonde. ↑ "Place-names in The Danelaw". viking.no. 2004 [last update]. http://www.viking.no/e/england/danelaw/epl-danelaw.htm. Retrieved 26 June 2011. ↑ "Thwaite Meaning and Definition". thinkexist.com year=2011 [last update]. http://thinkexist.com/dictionary/meaning/thwaite/. Retrieved 26 June 2011. ↑ "BBC - History - Legacy of the Vikings". bbc.co.uk. 2011 [last update]. http://www.bbc.co.uk/history/trail/conquest/after_viking/legacy_vikings_02.shtml. Retrieved 26 June 2011. This page was last changed on 6 November 2014, at 11:01.